It wasn’t to be. Barça Women defeated Levante 5-0 at Bunyol in the final league game but they didn’t win the title. Goals from Patri, Martens, Marta Torrejón, Andressa Alves and Andonova secured the win but Atlético Madrid’s victory against Zaragoza meant that the team from Madrid confirmed their title win. 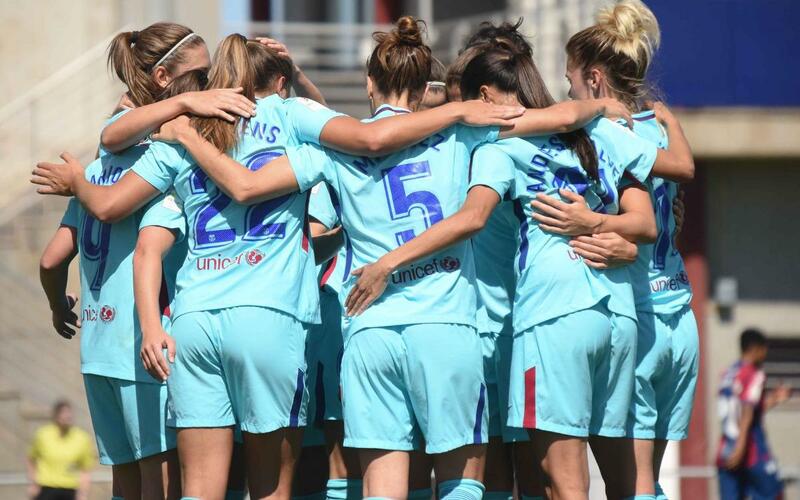 Barça Women started with intent from the off. The blaugranas suffered a setback in the 8th minute when Fabiana went off injured after a heavy collision. Despite this, they didn’t lose focus and Losada went close soon after with a shot that whistled wide of the post. The home keeper saved a dangerous Martens shot. The third good chance the blaugranas had led to the first goal of the match. After 18 minutes, Patri Guijarro got her ninth of the league with a strong crossed shot. The goal put Sánchez’s side in control. A great collective move culminated in Lieke Martens header flying into the night from a fantastic Melanie cross in the 30th minute. The second goal made the home side react as they threatened Paños’s goal for the first time with a Charlyn shot. Barça Women continued dominating the game without too many problems and they managed to increase their lead. In the 59th minute, Marta Torrejón scored after another great move. Less than five minutes later, Andressa Alves finished comfortably after a shot from Andonova against the crossbar. Then Alexia pressed Noelia into a mistake which led to Barça’s fifth in the 85th minute. Andonova shot into an empty net from the edge of the box. A great victory brings the league campaign to a close but, unfortunately, they ended a single point behind Atlético after pushing hard throughout.